The wreckage of a submarine which went missing with 44 crew on board a year ago has been found, the Argentine navy says. The navy stopped its rescue mission two weeks after the sub’s disappearance. However, a year and a day after it went missing, officials announced it had been found 800m (2,620ft) below the surface of the Atlantic Ocean. Who are the crew of the missing Argentine submarine? According to a tweet from the Argentine navy, the ARA San Juan had been positively identified under the water by a US company. The navy had earlier shared a picture from the seabed, suggesting a 60m-long object might be the missing submarine. Relatives gathered to remember their loved ones earlier this week, while President Mauricio Macri promised to keep up the search for the submarine. What happened to the sub? 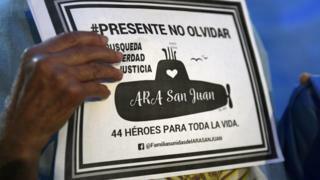 The ARA San Juan was returning from a routine mission to Ushuaia, near the southern tip of South America, when it reported an “electrical breakdown”. According to naval commander Gabriel Galeazzi, the submarine surfaced and reported what was described as a “short circuit” in the vessel’s batteries. The sub was ordered to cut its mission short and return to the naval base in Mar del Plata immediately. The Argentine navy’s last contact with the vessel was at approximately 07:30 (10:30 GMT) on 15 November, at which point its captain reportedly confirmed that the crew were well. Eight days after the sub vanished, the Vienna-based Comprehensive Nuclear Test-Ban Treaty Organisation said that it had detected a noise a few hours after the sub’s last contact. The body, which operates a network of listening posts to monitor nuclear explosions, said that there had been a “hydro-acoustic anomaly” about 30 nautical miles (60km) north of the sub’s last-known position at 10:31 (13:31 GMT). The Argentine navy said it could have been the sound of the submarine imploding. Navy spokesman Enrique Balbi told reporters last year that water had entered the submarine’s snorkel, which can be used to take in air from above the surface when the submarine is submerged. The saltwater dripped on to a battery tray in the prow, causing the battery to short circuit and to smoulder, he said. The sub had reported the fault and had been ordered back to base but then disappeared.